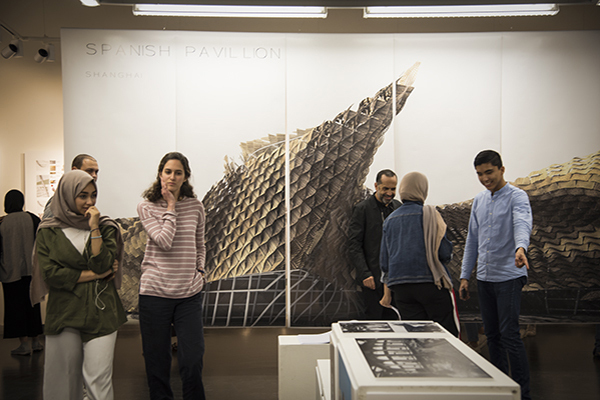 UAE architecture enthusiasts were treated to a unique display of architectural renovation and innovation, from concept to execution, at the region’s leading institution for studies in architecture, interior design and urban planning, this semester. The exhibition—Beginnings, Middle and End—opened in the College of Architecture, Art and Design (CAAD) at American University of Sharjah (AUS) in April 2018, revealing the phenomenal renovation of the Santa Caterina Market in Barcelona (1997–2005) and the unique design and execution of the Spanish Pavilion at the World Expo in Shanghai (2007–2010) by the Barcelona firm Miralles Tagliabue EMBT. Curated by CAAD’s very own Professor of Practice, Dr. Igor Peraza, the work on display provided comprehensive insight into the creative process, and included drawings of the design process, working drawings and details, as well as photos and videos of the construction and the completed buildings in Spain and China. A native of Caracas, Venezuela, Dr. Peraza was deeply involved with the exhibition content, having worked with EMBT Miralles Tagliabue from 2000 to 2009 as project director for the Santa Caterina Market project, in Barcelona. From 2009 to 2013, Dr. Peraza was Director of the EMBT’s Shanghai office, overseeing the Spanish Pavilion project for the World Expo event in China. Both projects showcased the way architects can utilize digital technology to produce complex shapes and structures within distinctly different urban and cultural contexts. “It has been a great opportunity to exhibit these two projects, which I built in a professional capacity as project director, and share them with the design community in a thoroughly academic context,” said Dr. Peraza. The Beginnings, Middle and End exhibition was made possible by the provision of graphic material by the Enric Miralles Foundation, the office of Miralles Tagliabue EMBT, and the University of Tongji. The exhibition will travel to Barcelona in the Fall 2018, then back to the UAE for display in Dubai in Spring 2019, and then on to Shanghai in Summer 2019.